On the one hand I should be happy that amongst the NATO allies the war in Afghanistan is completely an unsexy topic for discussion and that is especially true in Canada. War shouldn't be glorified but that doesn't mean we should ignore it. Especially if we have sent our troops there to fight, kill and die. That's kind of the problem. If you look hard enough all you can see is mayhem. Not freedom for Afghanis, who are no more free now than they were before our considerable contributions, just 8 long years of disjointed efforts to try and bring and then maintain stability in an ungovernable part of the world. Violence, death and chaos is what Canada along with her NATO allies have brought. And no matter how much the enemy is outnumbered or how superior our ordinance is, the final outcome is always unsure and often surprising. When discussing the nature of war and I want to get this point across I often refer people to the film "The Fog of War." If you watch it in its entirety you'll come away with the understanding that you cannot control what happens on the ground in war. No matter how well-meaning you may or may not be. No matter how smart you are, how much you plan for all manner of contingincies, you can never account for how humans will behave and react. You can't stick in the letter X to represent the unknown behaviour of those same people in the middle of the death and destruction and pretend you can come out with the answer to the equation. 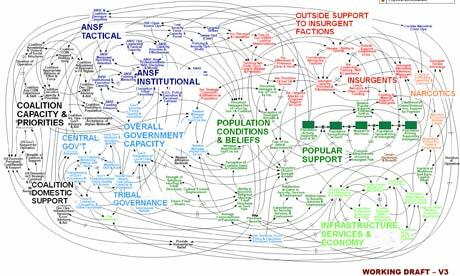 Any more than General McChrystal will ever understand his now infamous power-point presentation of which he said, "When we understand that slide, we'll have won the war." So when I tell you that it's being reported that NATO forces regard Afghan allies with fear, you won't be surprised that you never saw that reported in your local fish-wrap. Unsexy. You also won't be surprised that the coming offensive in Kandahar hasn't received any press of late and there's been little talk, especially from the Canadian government, because tough times are expected and that's unsexy too. Finally, and this is the equivalent of your overweight, grizzled and wrinkly uncle in a speedo, is the hard truth that for all their efforts and 8 long years of slugging it out, NATO forces are at the mercy of factors over which they have no control. It's one of war's true constants.